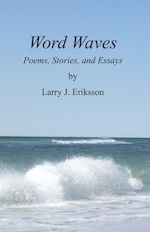 Word Waves contains poems published by the author from 2010 to 2016 as well as a small collection of his short stories and essays. The poems are organized by subject matter including such diverse topics as politics, aging, golf and music, nature, and technology. There is a detailed table of contents by subject and poem title as well as an index at the end of the book. Larry J. Eriksson is a Wisconsin poet active in the Dickinson Poetry Series at the UU Fellowship of Door County and a member of the Wisconsin Fellowship of Poets. He sees the world as filled with the music of poetry – a cosmic mystery driven by rhythms, rhymes, and riddles. His poems preserve memories, clarify thoughts, explore feelings, or simply have fun with language. They have appeared in numerous publications and are available at www.quartersectionpress.com. First Edition; 5½ x 8½; 286 pages; 2016.